If you’re in the biodiesel industry or are considering entering the industry, you may have heard of the Renewable Fuel Standard (also known as RFS2). It is important to understand this federal program since most biodiesel producers are required to participate in it, except for small or new biodiesel producers. The Renewable Fuel Standard is a program developed by the Environmental Protection Agency to comply with the Clean Air Act and the Energy Independence and Security Act (EISA). The first Renewable Fuel Standard was finalized in 2007, and the second, known as RFS2, took effect for biodiesel in July of 2010. The Renewable Fuel Standard is designed to increase the amount of renewable fuels used in the United States, in order to reduce air pollution and greenhouse gas emissions. The Renewable Fuel Standard requires petroleum refiners and importers to blend a certain percentage of biofuels into their fuels. The first Renewable Fuel Standard applied mainly to gasoline and ethanol. The second Renewable Fuel Standard mandates the inclusion of other biofuels such as biodiesel into the country’s petroleum fuel supply. RFS2 also mandates that biofuels used under the program cause less greenhouse gas emissions to enter the atmosphere compared to the petroleum fuels they replaced. Biodiesel producers and importers are required to participate in this program, as long as the fuel they make qualifies. However, the law allows for some exemptions. Producers of less than 10,000 gallons per year are not required to participate, nor are new producers–those who make less than 125,000 gallons per year and are in their first three years of operation. For more information about these exemptions, see section 80.1426(c) on page 14871 of Regulation of Fuel and Fuel Additives: Changes to the Renewable Fuel Standard Program; Final Rule. Under RFS2, biodiesel can qualify as a renewable fuel, as biomass-based diesel, and as an advanced biofuel. Below are the EPA definitions. These are from pages 14685 and 14686 of Regulation of Fuel and Fuel Additives: Changes to the Renewable Fuel Standard Program; Final Rule. Advanced biofuel – “a renewable fuel other than ethanol derived from corn starch and for which lifecycle GHG [greenhouse gas] emissions are at least 50% less than the gasoline or diesel fuel it displaces.” This can include ethanol from sugar or cellulosic material, as well as biomass-based diesel. Biomass-based diesel—“includes both biodiesel (mono-alkyl esters) and non-ester renewable diesel (including cellulosic diesel).” Biomass-based diesel is a subset of the Advanced Biofuels category. The fuel must be made from renewable biomass; its lifecycle GHG emissions must be at least 50% less than the diesel fuel it displaces; and it cannot be co-processed with a petroleum feedstock. If biodiesel does not meet one of the above definitions, it cannot generate RINs (Renewable Identification Numbers) under the RFS2 program. However, it could still be sold on the market without RINs. Also, if you make biodiesel from a feedstock that has not yet been approved by the EPA to participate in the RFS2 program, you can still sell this biodiesel, but you would not be able to generate and sell RINs. The exception is plants that started construction before December 19, 2007 (in other words, before the enactment of EISA). These “grandfathered” plants can sell biodiesel and generate RINs under the “renewable fuels” category even if the feedstock has not yet been approved, as long as the feedstock qualifies as “renewable biomass.” See the Greenhouse Gas Reduction section below for more information. 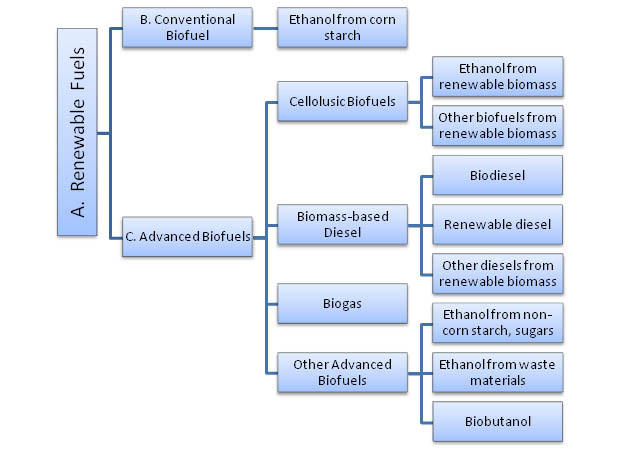 The chart below illustrates the various biofuels which qualify under RFS2. As explained above, biodiesel fits into several categories: biomass-based diesel, advanced biofuels, and renewable fuels. There are a couple of other criteria to keep in mind. You’ll notice the definitions above make reference to “renewable biomass” and “greenhouse gas reduction.” Biofuels sold under RFS2 must be derived from renewable biomass, and must meet certain greenhouse gas reduction targets. The EPA has specific ways to determine whether a fuel meets these criteria. Planted crops and crop residue harvested from agricultural land cleared or cultivated at any time prior to December 19, 2007 that is either actively managed or fallow, and nonforested. Planted trees and tree residue from actively managed tree plantations on non-federal land cleared at any time prior to enactment of this sentence, including land belonging to an Indian tribe or an Indian individual, that is held in trust by the United States or subject to a restriction against alienation imposed by the United States. Animal waste material and animal byproducts. Slash and pre-commercial thinnings that are from non-federal forestlands, including forestlands belonging to an Indian tribe or an Indian individual, that are held in trust by the United States or subject to a restriction against alienation imposed by the United States, but not forests or forestlands that are ecological communities with a global or State ranking of critically imperiled, imperiled, or rare pursuant to a State Natural Heritage Program, old growth forest, or late successional forest. Biomass obtained from the immediate vicinity of buildings and other areas regularly occupied by people, or of public infrastructure, at risk from wildfire. Separated yard waste or food waste, including recycled cooking and trap grease. In order to protect forests and other ecologically sensitive land, biomass taken from the following types of land is NOT included in the EPA’s definition of renewable biomass: 1. forestland; 2. rangeland; 3. other ecologically sensitive land. In addition, crops or residues from land cleared for farming after December 19, 2007 are not eligible as renewable biomass. An in-depth discussion of renewable biomass starts on page 14691 of Regulation of Fuel and Fuel Additives: Changes to the Renewable Fuel Standard Program; Final Rule. The Renewable Fuel Standard “marks the first time that greenhouse gas emission performance is being applied in a regulatory context for a nationwide program,” according to the RFS2 Final Rule (see p. 14670). In other words, for the first time a federal program is regulating transportation fuel according to its greenhouse gas emissions. The EPA has done life cycle analyses for biodiesel from specific feedstocks, to determine if the fuel reduces greenhouse gas emissions by at least 50%, compared to petroleum diesel fuel. As of February 2011, the EPA has approved biodiesel from soy oil, oil from annual cover crops, algae oil, waste grease, animal fats, non-food grade corn oil, and canola oil, as meeting the 50% greenhouse gas reduction necessary to be sold as “advanced biofuel” or “biomass-based diesel”. Keep in mind that individual plants proposing to use these approved feedstocks still need to be evaluated by the EPA to determine whether their processes are compliant with the 50% greenhouse gas reduction. See Table 1 on page 14872 of the RFS2 Final Rule for the feedstocks approved as of March 2010. For information on the life cycle analysis of canola oil (which was approved later), see Notice of Supplemental Determination for Renewable Fuels Produced Under the Final RFS2 Program from Canola Oil. The EPA is currently reviewing data on palm oil biodiesel to see if this can be approved. Biodiesel that does not meet the 50% target but does meet a 20% greenhouse gas reduction could still be sold under the “renewable fuel” definition. Thus far, all the biodiesel feedstocks that have gone through the EPA process meet the 50% reduction, so this is not really an issue as of 2011. In other words, if the biodiesel plant commenced construction before December 19, 2007, and if this plant makes biodiesel from a feedstock that has not yet gone through the EPA’s approval process, this biodiesel could still be sold and generate RINs under the “renewable fuel” category. In this case the biodiesel would generate 1 RIN per gallon. There is no “grandfather” provision for advanced biofuels or biomass-based diesel. For more information on how the EPA modeled the life cycle analyses of biodiesel and ethanol, see Renewable Fuel Standard Program (RFS2) Regulatory Impact Analysis. A RIN is a 38-digit number that is assigned to each batch of biodiesel that is sold. Biodiesel with a RIN sells for more money than biodiesel without a RIN, because petroleum refiners must show that they have obtained a certain amount of RINs in order to prove that they incorporated biofuels into their fuel. RINs are generated when eligible renewable fuels are produced, or when eligible renewable fuels are imported. The producer or importer registers with the EPA and goes through an approval process. Then, when biofuels are produced or imported, the EPA assigns the RIN numbers. These RINs are sold with the fuel, and can only be separated when the fuel is blended with petroleum, or when a petroleum refiner or importer buys the renewable fuel. Once separated, these RINs can either be “retired” to show compliance with the law, or they can be sold separately. When biodiesel is exported, the RINs must be separated and retired. They cannot be sold. Fuel sold as “renewable fuel” (mostly corn-based ethanol at this point) carries 1 RIN per gallon. Fuel sold as “advanced biofuel” or “biomass-based diesel” (biodiesel can fit into either category) carries 1.5 RINs per gallon. In other words, because biomass-based diesel is expected to achieve a greater greenhouse gas reduction than corn-based ethanol, it carries an “equivalence value” of 1.5 times that of ethanol. There are also a few other categories of biomass-based diesel: “cellulosic diesel” and “renewable diesel.” Cellulosic diesel is not being commercially produced at this point, but if it were commercially produced, producers would be able to participate in the RFS2 program. Renewable diesel is being produced by petroleum companies, who convert vegetable oil and animal fat to hydrocarbons instead of methyl esters. This renewable diesel is not sold but is simply blended into petro-diesel fuel. If it were sold in the marketplace, renewable diesel can also participate in the RFS2 program. Cellulosic biodiesel is expected to achieve a 60% reduction of greenhouse gases and carries a RIN value of 1.7. See information about equivalence values on page 14709 of the RFS2 Final Rule. “America Advances to Performance-Based Biofuels: The Advanced Renewable Fuel Standard/RFS2,” by Clayton McMartin and Graham Noyes, Stoel Rives Attorneys at Law, February 26, 2010.